S&R Pool & Spa never wants you to mix, measure or handle harsh liquid or tablet chlorine ever again. The days of bleaching your clothes from liquid chlorine are behind you. No more coughing when you open the chlorine tablet bucket. Catch the Salt Wave!!!!! Salt chlorine generation is the easiest and most economical way to enjoy your swimming pool. Salt chlorine generation leaves no chlorine odor, no bleaching of your bathing suits, no more red eyes and the water feels soft and silky smooth. 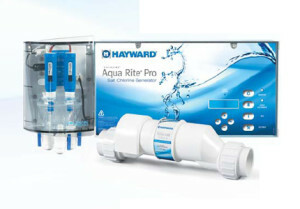 Salt chlorine generation offers even and consistent chlorine dispersion because it is making a small amount of chlorine only when the filter is on. The Aqua-Rite salt chlorine generator requires minimal maintenance, is user friendly, and has a low operating cost. The Aqua-Rite Salt Chlorine Generator uses advanced electrolytic technology to convert ordinary salt into pure chlorine. One teaspoon of salt can produce 1.45 pounds of chlorine which is enough to sanitize up to a 40,000 gallon pool. The amount of salt in your pool is between 2600 -3600 ppm which is barely detectable by taste. You will not have a salt residue on your skin when you come out of the pool like you have when you swim in the ocean. The ocean salt content is 50,000ppm which is 16 times greater than a salt water pool. The Aqua-Rite has a control panel and a patented salt cell. The control panel sends a safe electrical charge to the salt cell energizing the salt cell. The salt cell is installed in the return line of your filtration system and as the water passes through the cell it is converted into chlorine. Each salt cell is sized according to each pool size. What are you waiting for? 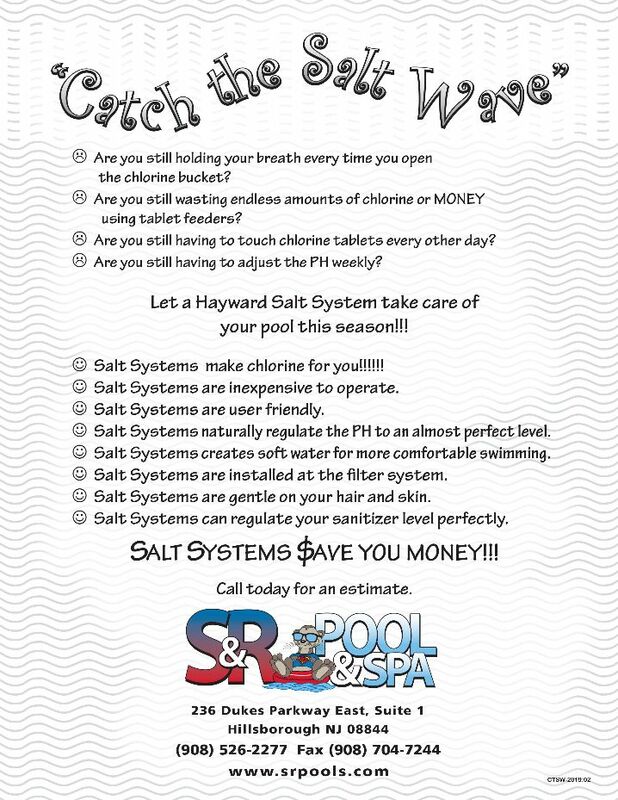 Catch the salt wave to safer, easier and more economical swimming!!!! !